www.prekandksharing.blogspot.com PreKandKSharing: Red, White and Blue, Patriotic Art Projects! HAPPY almost FOURTH OF JULY!! 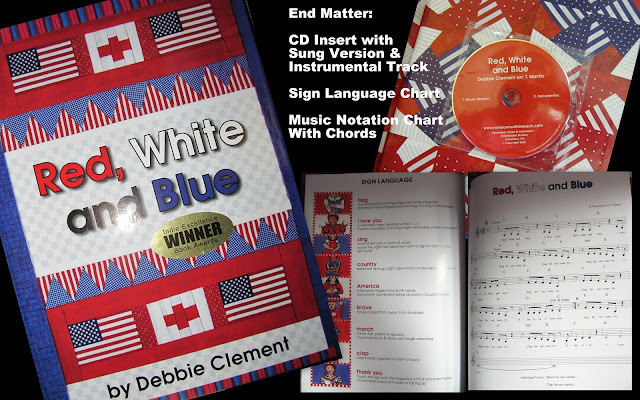 Last month for America's flag day, our very own Carolyn Wilhelm selected my newest picture book for the focus of all her loving attention. 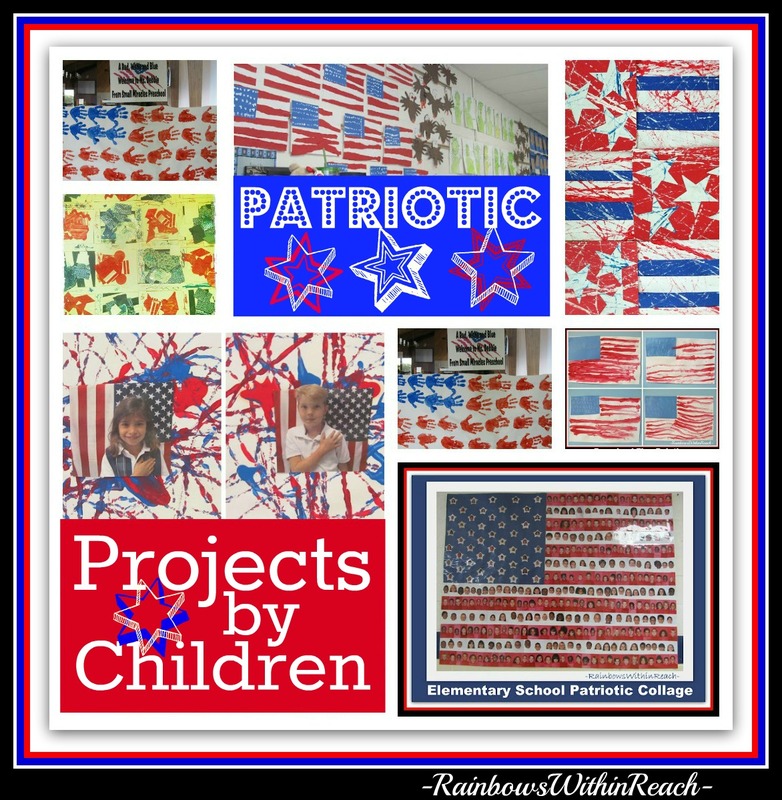 She did her usual brilliant work at creating an amazing FREE resource with patriotic images for all things numeric. I was so very surprised and delighted. Immediately as I saw her hard work and kindness I was given the 'focus' for my entry this month. Again, timely! 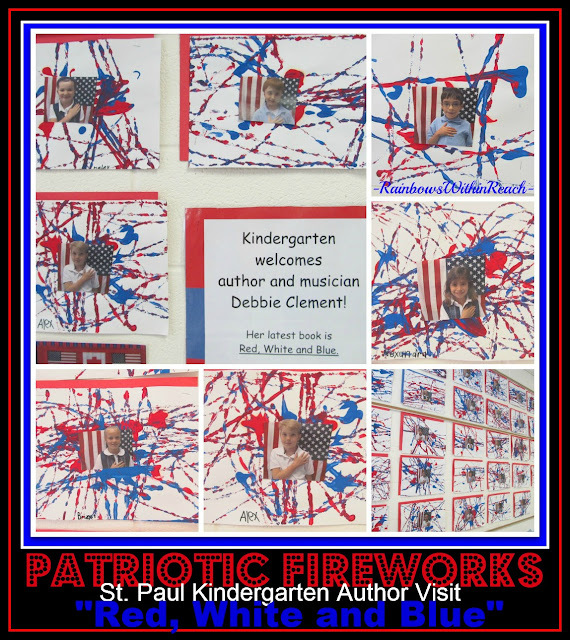 I realize that we have readers from around the globe, for whom the 4th is not a national holiday, so please excuse this second Ameri-centric article in quick rotation -- as I share classroom and student response to my book, "Red, White and Blue." The text of my picture book is the lyric of my original song by the same name. I wrote the simple repetitive 'dittie' immediately after 9-11. 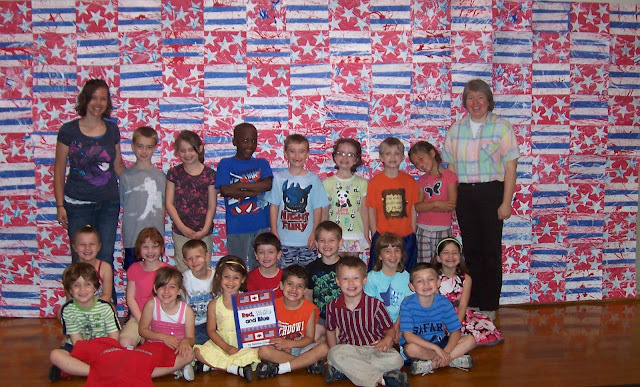 Today I have images to share from my Author-Illustrator School Visits, where teachers have directed their students to respond to the quilted graphics in my project. 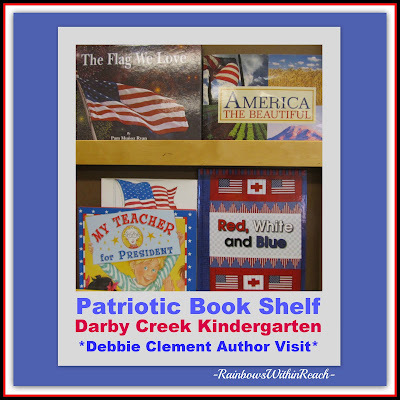 It's so exciting to make my way into the classroom and find my own book amid other patriotic choices. Here's a recent kindergarten bookshelf upon my arrival. 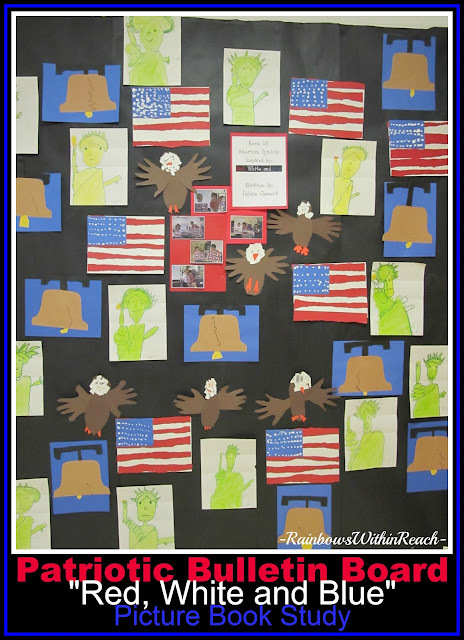 Let's start with the amazing response from a kindergarten team of teachers at St. Paul Catholic School in Westerville, OH. We think that I have come for an end-of-the-year visit with their students every year for the past nine years. It's kinda like ol' home day with LOTS of hugs upon my arrival each May. 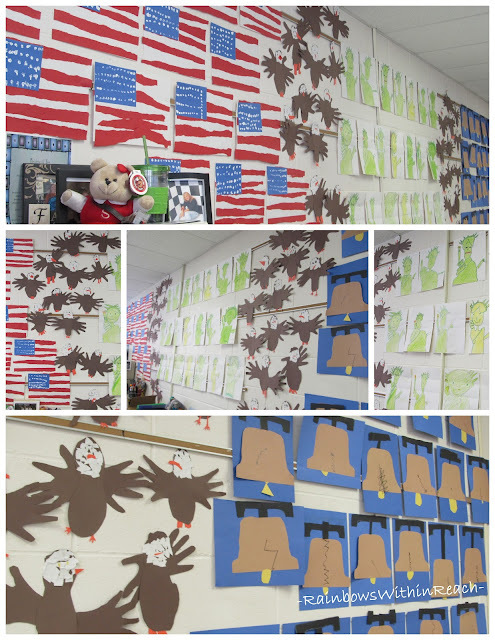 The teachers both have bulletin boards of the children's art in response to each of my books. 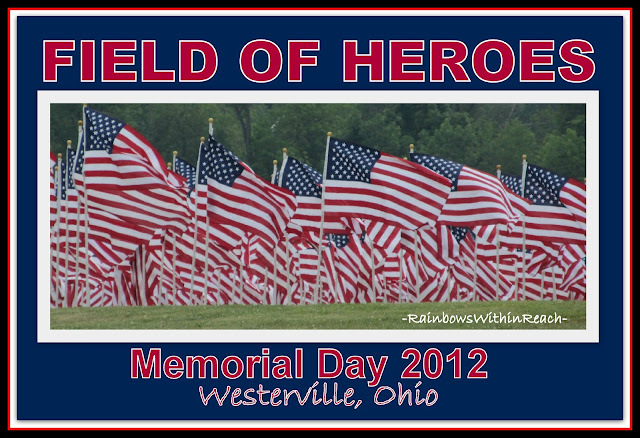 Today lets look at their patriotic efforts. Now let's take a look at one way to convey fireworks in an open-ended Art exploration. As you've probably imagined, these fireworks are created with 'marble rolling' through paint. I LUV the way they frame each individual student's photo. Trust me. Together the entire bulletin board is A.MAZ.ING! 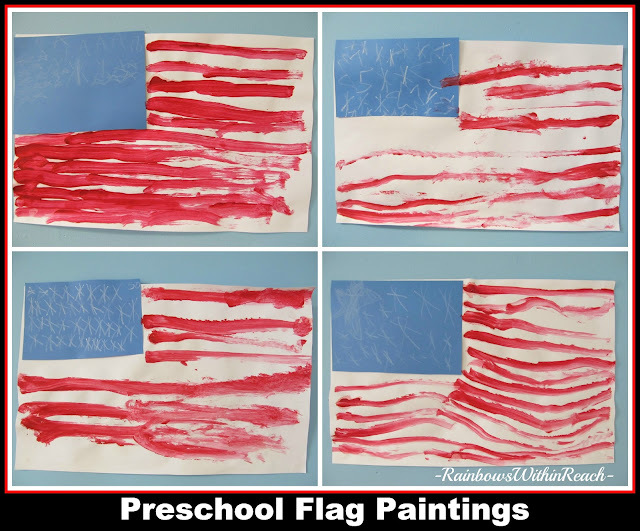 Now let's take a look at a preschool flag of delight. One can never have enough painted hand prints from children. This was my welcome to the Chicago-land area at Small Miracles. LUV LUV LUV it! 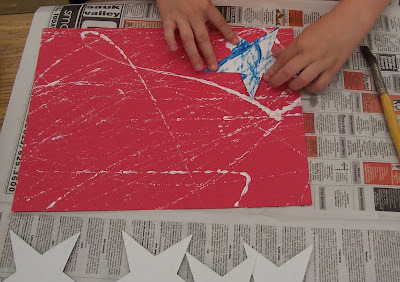 Simple enough to create for children participating in a summer program. 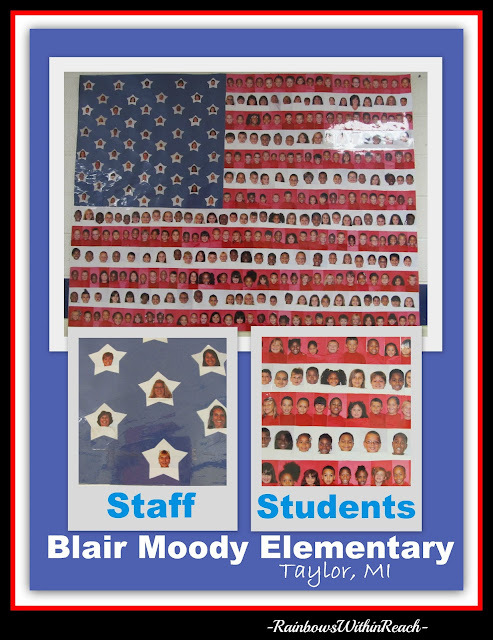 This is an INCREDIBLE photographic extravaganza from Blair Moody elementary school up in Taylor Michigan. 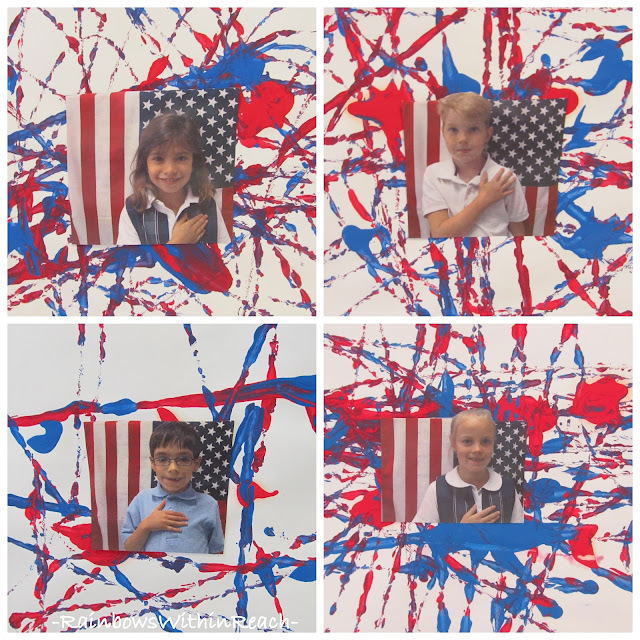 As you can see each student is photographed individually to become a montage of smiles in the stripes and the teachers and staff are captured for the field of stars. LOTS of work. I think I've seen something like this on Pinterest -- but I have to tell you that seeing a work of this nature in person is so very inspirational. Much work for a HUGE and permanent outcome for a whole year and beyond! 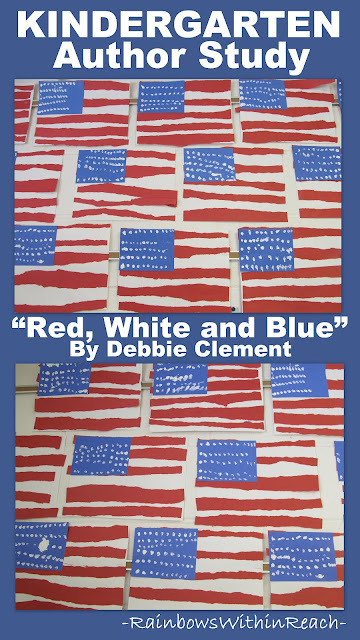 These flags were created at the Preschool easel in Powel, OH in anticipation of my arrival. LUV their sincere simplicity and the individual style that is captured in each treasure. What an awesome project and appropriate for framing! 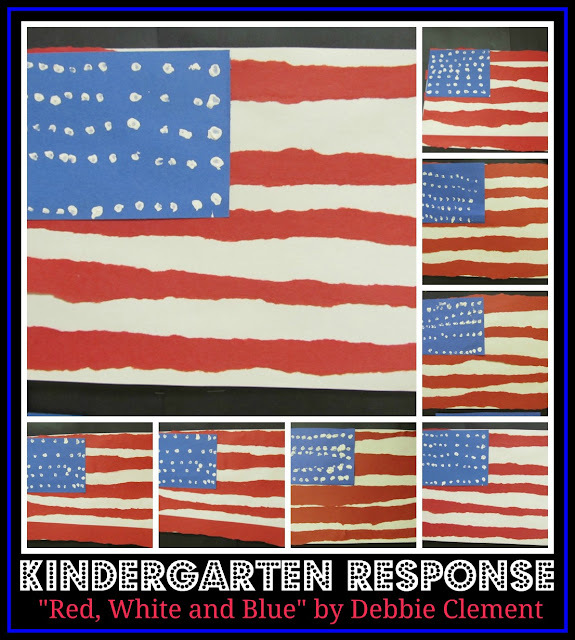 Here's an even younger 'response'....... these beauties were created by a group of 'oldish' toddlers in New York City. Their center is right in the heart of the city. The children each created their own 'collage' quilt square in preparation for my arrival. Somehow in all of the excitement I forgot to take photos myself and this was sent via cell phone after the fact, but I think that you can still see the texture and fun in this work. It's a combination of scrap book papers and art supplies and other miscellaneous fabrics and bits and bobs. This next image is an actual framed piece of art hanging in the Jones Center in Arkansas. Another variation on young, painted handprints. Whenever a finished piece is indeed 'framed' it conveys the worth of the subject and adds to its sense of permanency. I'll conclude with an absolutely un-be-lieve-able project created in a classroom that I have never visited. That's the power of the book!!! The book can travel to places that the author has yet to visit. 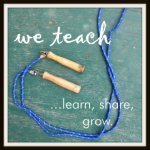 This incredible work was created by our contributing author here, Carie. We met at a reading conference in her home state of Illinois. 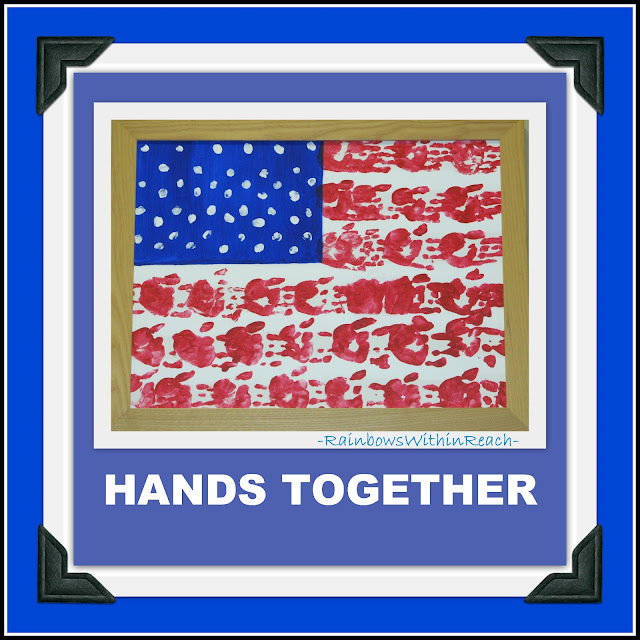 She tells her story of serving in the US Army for nine years before taking over the reigns of the kindergarten classroom. 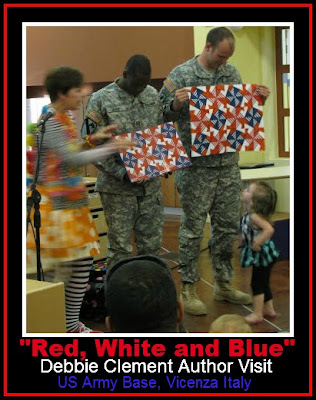 She served a year in Iraq and needless to say, has a profound sense of patriotism and adoration for our flag. She is also an appreciator of quilting. When we met she promised a quilt response to my book. 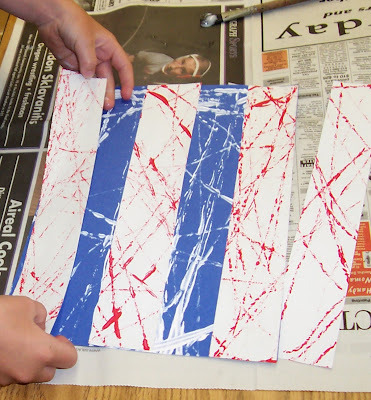 Carie also used the technique of marbles rolling through paint to create the papers for their quilting. That's Carie over on the left hand side of the picture. That's my book being cradled lovingly in the front row. Yes, folks it turned out to be 19 feet wide and 11 feet high. That's the power of the book in the hands of a dedicated teacher! 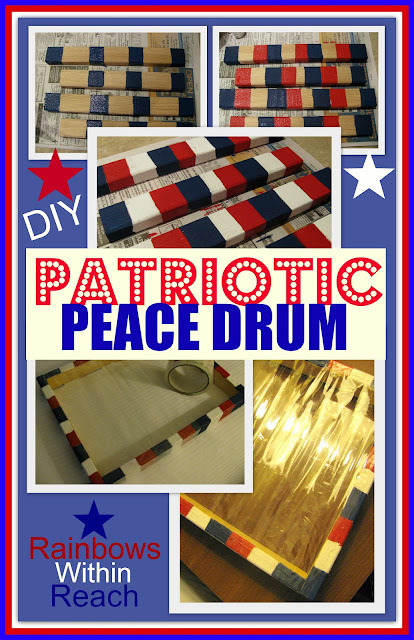 I had a recent 'Tutorial Tuesday' where I focused on the simple steps of building a peace drum. You can jump over to my blog if you need more of a description beyond the photos. Drumming provides so many opportunities for young children. You could use the same 'wrapping-with-tape' concept around a shadow box/deep picture frame to simplify your life. 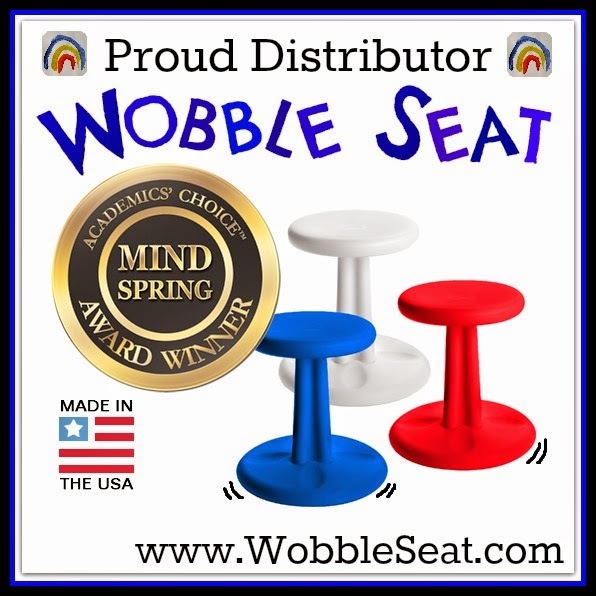 We get most of our 'traffic' here thru Pinterest. 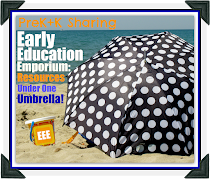 Debbie Clement writes her own blog over at RainbowsWithinReach. From that venue she shares her travels from around the block, around the city, around the country and yes around the world!! The opportunity of a lifetime arose where she was able to take her book and visit 4 US Army bases across Europe. Follow your dreams people. Follow your dreams. This is such an inspiring post. 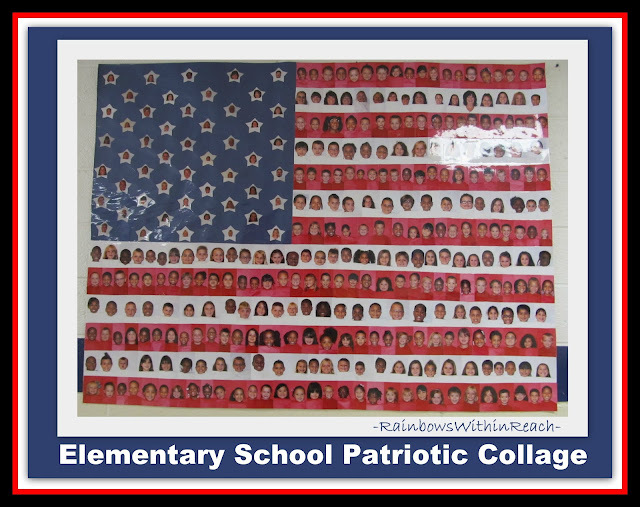 I love the huge flag with the children's faces. The pictures with their hand on their hearts is precious too. 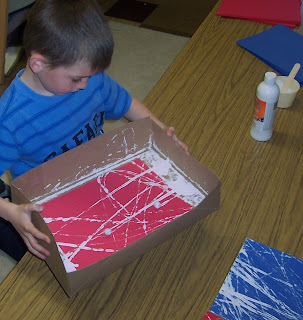 I would make these with First graders when I was an Elementary Art Teacher!